As the balance of Fandango traffic tipped toward mobile, we witnessed a dramatic shift in the purchasing patterns of our customers. More and more users were becoming convenience customers — purchasers who are not driven by the fear of tickets selling out, but who simply want to get to their seats as quickly and effortlessly as possible. As such, these users have a tendency to purchase much closer to showtime, oftentimes within an hour or two. Given this more immediate purchasing behavior, we ventured to create the perfect product for their needs. Convenience customers spend very little time performing research within the apps — they already know which movies to see, what theaters to attend, and when they want to go. With this in mind we pared down the process of selecting a theater, movie, and showtime from three pages to one. In the interaction model for Fandango Express, the user moves fluidly from theater to theater through horizontal swiping. 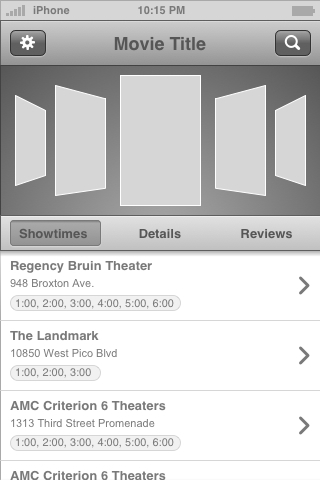 When a user taps on a movie, the showtimes are displayed via a slide-out pane, which is easily dismissed by tapping back on the movies area or swiping the pane to the right. When purchasing an hour before showtime, every second counts. 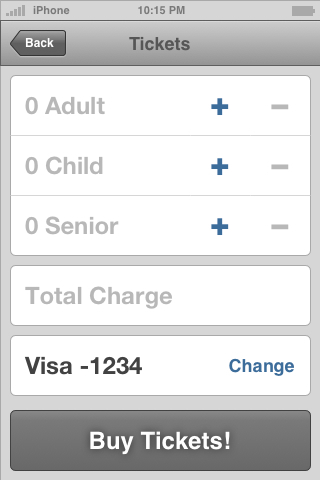 We took the four-step process of ticket purchase and distilled it to a single-page experience, saving the user time and reducing the potential for errors and timeouts. To validate the Fandango Express concept, I created an Axure prototype that was usability tested on-site. The concept was positively received, and our findings helped inform the final design. Fandango Express was taken through a number of design iterations. Below are some earlier incarnations of the concept.